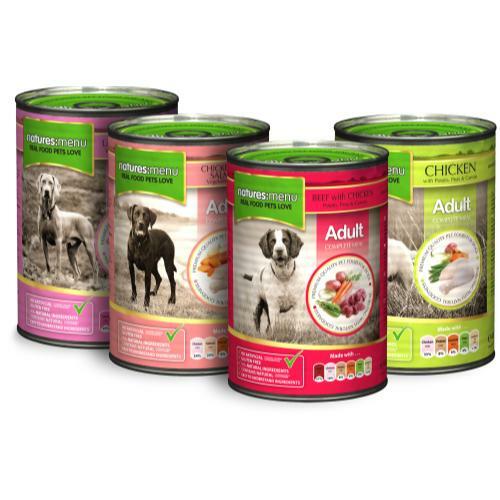 Natures Menu Multipack cans are a delicious, natural, & complete dog food containing three cans of each of their adult flavours: Beef & Chicken, Chicken & Salmon, Beef & Tripe, and Turkey & Chicken. Free from artificial colours, flavours and preservatives, each tin is filled with quality raw ingredients before being sealed and gently steamed, ensuring all the nutrients are locked in tight. Free from common fillers like wheat, corn, bran, and soya, Natures Menu tinned food contains a minimum of 55% meat – and no meat derivatives. With a range of lean meats rich in muscle maintaining and repairing protein, and added sunflower oil for healthy joints. Chicken & Salmon: Chicken (min 34%), Salmon (min 25%), Carrots (min 6%), Rice (min 4%) Peas (min 4%), Sunflower oil (<1%). Chicken with Vegetables : Chicken (min 55%), Potato (min 8%), Carrots (min 6%), Peas (min 4%), Sunflower oil (<1%). Beef & Chicken: Beef (min 37%), Chicken (min 18%), Potato (min 8%), Carrots (min 6%), Peas (min 4%), Sunflower oil (<1%). Lamb & Chicken: Lamb (min 30%), Chicken (min 29%), Carrots (min 6%), Peas (min 4%), Rice (min 4%), Sunflower oil (<1%).